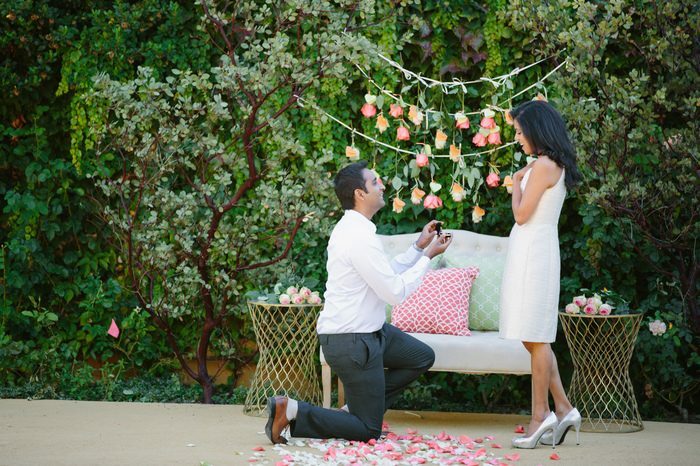 Kamana and Shivanth's Proposal on HowTheyAsked! We met online during the end of December. When Shivanth first came to visit me in DC, the first thing I noticed was his smile. We met for brunch and ended up spending the day together, talking, laughing, getting to know each other. He was sweet, funny, and we ended up on a 10 hour long first date. Even that winter was really cold, the weekend he came, the weather was amazing we were about to walk around and explore the city. That’s the thing with us – everything always works out and feels so much better when we are together. On a January afternoon in DC, I walked up to Kamana’s apartment to take her out on our first date. I buzzed her apartment and waited for her patiently while i saw a number of other residents walk in and out. Suddenly I see this beautiful girl walking towards me from one end of a really long hallway. I couldn’t see who clearly but her smile, presence and grace captivated me in that instant. I had to pinch myself to make sure I was not dreaming. I was praying that this person was Kamana at that instant. As she got closer all I could think was what did I do to be so lucky in life! 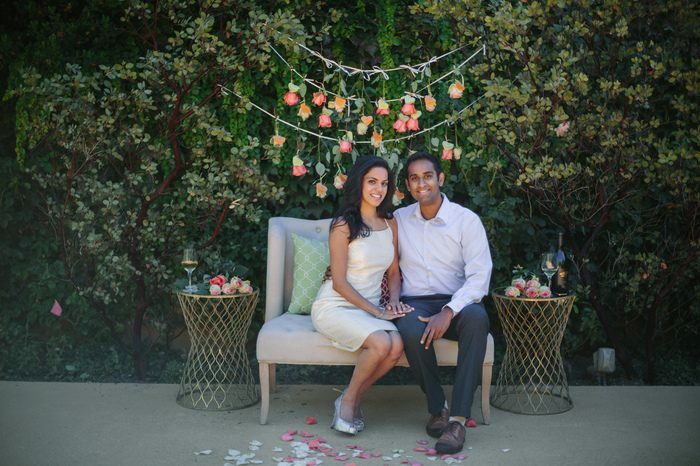 After dating for eight months, meeting each other’s family – we were ready to take the next step. I had planned a trip to visit Shiv (my Fiancé) in SF, but was not expecting anything out of the ordinary. Shiv mentioned that he had an awards breakfast for work on Sunday. Thankfully, (since he knows me so well) Shiv mentioned that we would be taking pictures. After searching for a week, I found a pretty white shift dress on sale at Anthropologie the day before my flight. 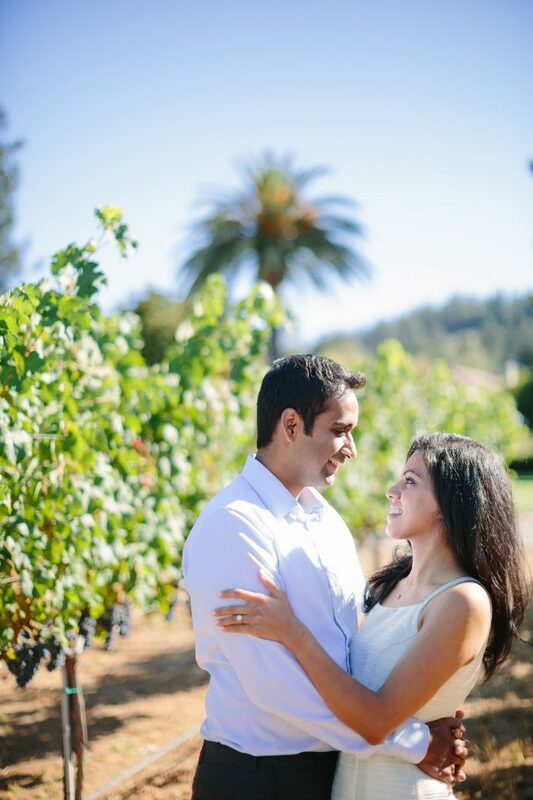 On Sunday morning, we drove to the idyllic Chateau St. Jean, nestled in the heart of Sonoma Valley. As we approached the estate, I saw an enchanting castle with vineyards, lush gardens, and ivy covered arches all around. Smelling the scent of vines, grapes, and roses entwined with the morning dew, I marveled at how the scenery complimented the crisp summer morning. As we turned into the parking lot, I noticed there weren’t many cars. Where is everyone I wondered? I followed Shiv into the Chateau’s secret garden. As I entered, I heard my favorite Atif Aslam song playing (the live acoustic version of Pehli Nazar Mein). 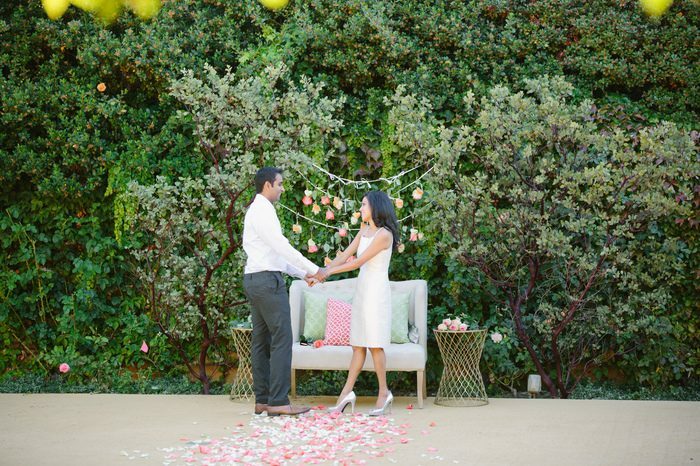 Walking in, I saw pink and white rose petals scattered on the walkway – leading to a cozy little couch. 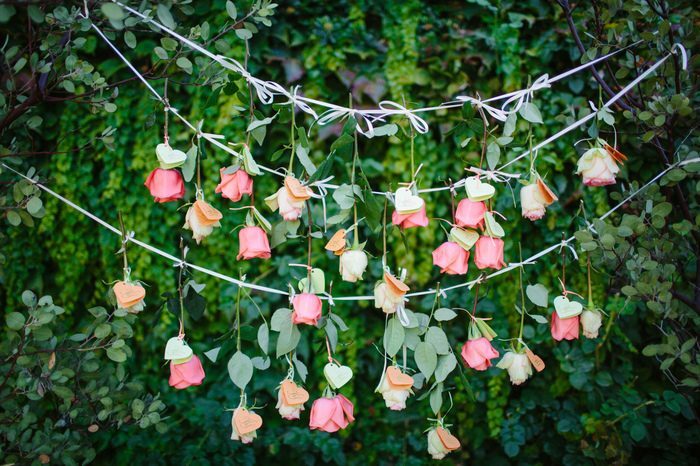 Above the couch were roses hanging from two trees with hand written notes on heart-shaped cards. A monogram with our initials was etched on each mint and coral colored heart (my favorite colors). Inside each card was a message about why he loves me. Reading the cards, I was so touched by the elegance and beauty of each detail he had thought of. 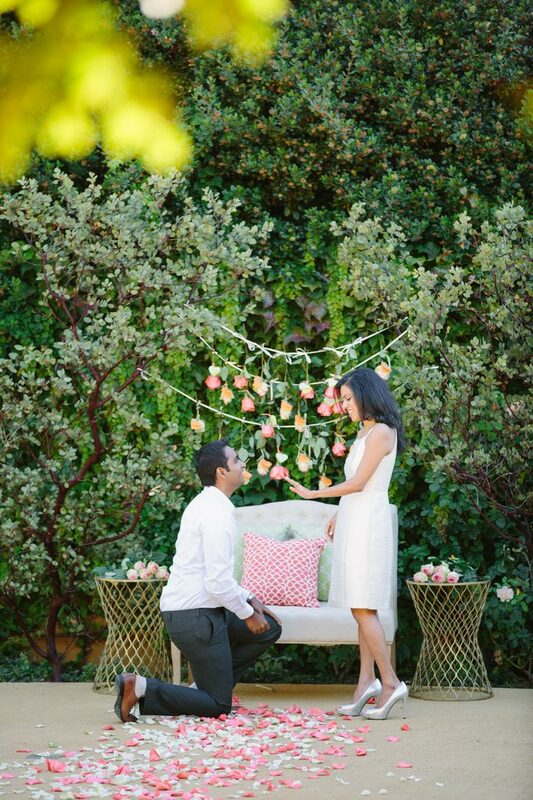 Then Shiv went down on one knee…. 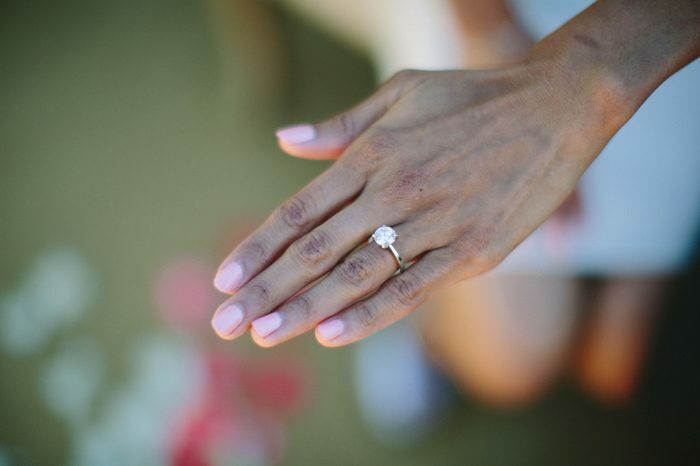 And he proposed with the most stunning ring I have ever seen. There were so many emotions and feelings of happiness wrapped in that moment. After the proposal, we called our parents to celebrate! We then took photos with our amazing photographer, Melissa, from Weddings by Sunnyside. We had the estate to ourselves since Shiv rented it out for the morning to keep the experience more intimate. Next we went for a reserve wine tasting in the Chateau’s private outdoor lounge and enjoyed the estate’s award-winning chardonnay. Ending the best afternoon of my life, we had brunch at Napa’s historic Auberge du Soleil restaurant. We dined on the patio overlooking the gorgeous vineyards and enjoyed sparking wine with our favorite dishes. Including my favorite – chocolate mousse topped with triple crown blackberries, white velvet cake, and pistachio dentelle – so delish.